Background: HCV is a contagious blood-borne virus that attacks the liver and can be deadly despite often having no visible health warnings. IL-18 is an important proinflammatory cytokine secreted from Kupffer cells. It is involved in the pathogenesis of HCV infection through modulating immune functions by regulating IFN-γ production and promoting the development of Th1 immune responses. Objective: The aim of this study is to measure serum level of Il-18 in chronic hepatitis C patients and compare between Il-18 levels and the degree of liver fibrosis. Subjects & Methods: This is a case control study. 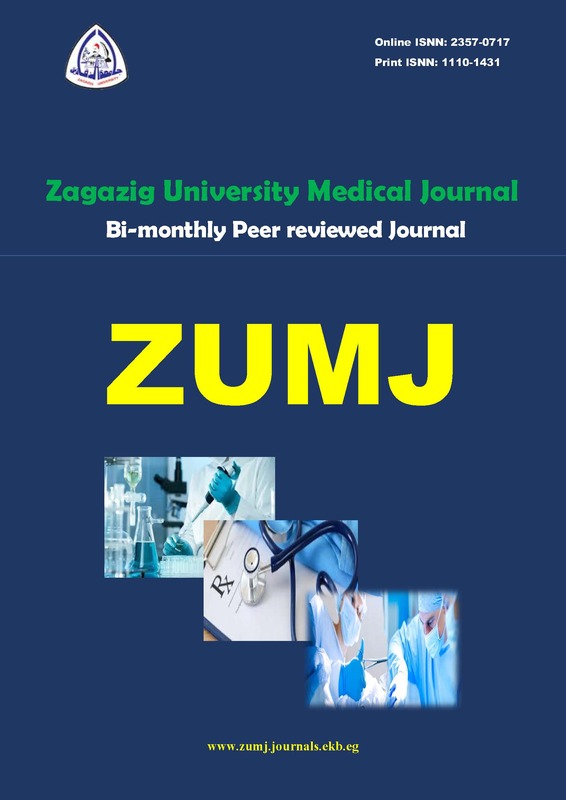 It was conducted in Clinical Pathology and Tropical Medicine Departments, Faculty of Medicine, Zagazig University Hospitals during the period from June 2017 to August 2017. Eighty four subjects were included in this study; they were classified into three groups as follows: Group 1: composed of 28 (17 males,11 females) apparently healthy subjects their ages ranged from 27 to 61 years old . Group 2 :composed of 28 patients (15 males,13 females) with HCV infection diagnosed as HCV RNA positive serum by RT-PCR with normal liver enzymes(ALT,AST), their ages ranged from 25 to 63 years old. Group 3 :composed of 28 patients (16 males,12 females) with HCV infection diagnosed as HCV RNA positive serum by RT-PCR with elevated liver enzymes (ALT,AST) their ages ranged from 29 to 64 years old. Formal consent was obtained from all individual and the study protocol was approved by the Zagazig medical research ethical committee. Seven ml of venous blood was withdrawn by sterile venipuncture and used for routine investigations including, complete liver function tests, HCV antibodies by ELISA and HCV-RNA by RT-PCR and IL-18 serum level by ELISA technique. Results: Group III showed highly statistically significant increased ALT and AST when compared to both group I and group II. There were high statistical significant differences between the three studied groups as regard Albumin level, Prothrombin time, Concentration (%) and INR. There was statistical significant increase in viral load by PCR in Group III compared to Group II. There were high statistical significant differences between Group III compared to both Group I and Group II in IL-18 level. there were statistical significance increase in IL-18 level with increase degree of liver fibrosis in both Group II & Group III. There was positive significant correlation between IL-18 level and AST in Group III. There was positive high significant correlation between IL-18 level and viral load in Group III. Conclusion: Serum IL-18 is significantly increase in chronic HCV patients and is correlated with liver fibrosis staging determined by fibroscan. So, IL-18 can be used as a non-invasive pro inflammatory marker for detection of the chronicity and severity of liver fibrosis in CHC.